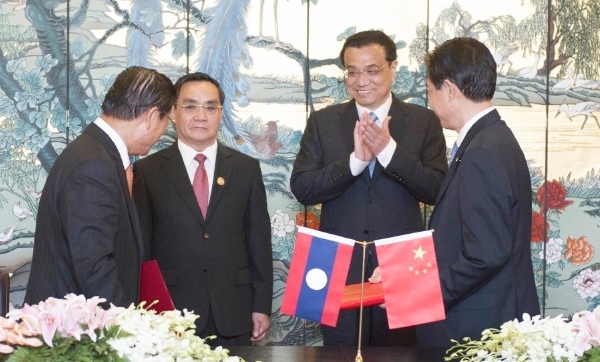 Chinese Premier Li Keqiang on Tuesday vowed to boost ties with Laos, one of Asia’s poorest but fastest growing countries. China and Laos are also launching negotiations on a railway cooperation agreement, said Li. The Chinese Premier held talks with his Laotian counterpart Thongsing Thammavong in Sanya in South China on Tuesday at the end of which the two sides signed a bilateral financial cooperation deal. China will push for an early conclusion of the deal, as railway cooperation constitutes an important part in bilateral cooperation on major projects, Li told Thongsing, head of the communist state run by the Lao People’s Revolutionary Party. Spurred by massive investment from China and other Asian nations, Laos had seen years of more than 8 per cent growth. The IMF has, however, recently warned that the Laos economy is “overheating” and inflation is projected to rise up to 9.4 per cent in 2014. Premier Thongsing’s administration is banking on massive infrastructure projects to turn the economy around. The prospective railway deal with China, including high-speed rail links, could bring major economic benefits to the land-locked Asian nation. China had earlier announced plans to build an ambitious 120 mph railway that would reach all the way to Singapore via Laos from Southwest China. According to official data, China was Laos’ largest foreign investor in the first 11 months of the 2012-2013 financial year with projects worth over $1.33 billion. Meanwhile, Asian leaders are converging in the Chinese city of Sanya for the annual conference of the Boao Forum for Asia (BFA) later this week.